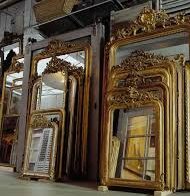 Yes, we resilver mirrors – both furniture mirrors and antique auto mirrors. As a complete service antique restoration shop, we pride ourselves in being able to offer this unique service to our customers. We also sell the chemicals and supplies so you can do it yourself, if you want to. In addition to furniture mirrors, we also resilver antique automobile mirrors. We’ve resilvered theatre spotlight lenses, sailboat search light lenses, railroad signal lenses, archery sight mirrors, and we’ve even done laboratory and telescope mirrors. So, if you have a mirror that needs to be resilvered – or a piece of glass that needs to become a new mirror – we can probably do it for you. If you have questions, or would like more information, click the ‘Ask a Question’ button and email us. If you’d rather talk to us directly on the phone, the number is 712-625-2403. We’re available 9:00 – 4:00 Central Time, Tuesday through Friday. Our mailing address is: Inman Historic Interiors, 3367 170th St, Randolph, IA 51649. How much does it cost? Commodity Market Silver metal prices have increased dramatically, so we’re forced to adjust our prices for resilvering, too. Click here to see our new Mirror Resilvering Price List. Remember, when we resilver your mirror, we replate with a heavy coating of pure genuine silver metal. Unlike many new mirrors today,we do not us chrome or aluminum on any mirrors we resilver. So, when we say we ‘resilver’ we really mean it! Can we ship our mirror to you via UPS, USPS or FedEx for resilvering? Yes! Many folks ship us their mirrors for resilvering. If you would like to send us your mirror, please contact us for packing instructions before you ship. Resilvering prices on our list do not include shipping. Will My Mirror Come Out Perfect? All old mirrors have flaws and scars of age. Scratches and chips are obvious. Sometimes the polish of the glass has been etched by time and exposure to air when the original backing paints are damaged or failing. When we resilver your mirror, we bond new silver to your old glass. Although we re-polish by hand, and make the mirror surface as perfect as possible, sometimes there are imperfections in a resilvered mirror. The quality of your resilvered mirror is directly related to the quality and condition of the BACK side of your glass. The better the glass is before resilvering, the better or more perfect you can expect your resilvered mirror to be. Old mirrors, especially old mirrors which have gotten into pretty bad condition, can be expected to show some scars and marks of age. This is what makes a resilvered mirror an antique with character. Usually, the imperfections are not noticeable unless you are trying to look for them. Viewed head-on, they are almost never seen. In a glare angle, they show most, especially ‘cloudy’ areas. What about the risk of breakage? There is always a chance of breakage whenever we ship and handle old glass and mirrors. Inman Historic Interiors does not guarantee against broken glass. We simply can not. So, we need you to understand that when you send us your mirror, there is a chance of breakage and the risk is yours. We do not charge for our work or chemicals in the event of a broken glass. If the mirror breaks, we all feel bad together. We wish it was different, but there is not any way we can guarantee against this risk. Fortunately the risk is extremely small. We have silvered mirrors and glass since the 1970’s and can count the broken mirrors on one hand. But still…there is always a chance and we want you to be informed before you make your decision to send us your mirrors. Since the 1970’s, when we developed our own resilvering chemicals and processes, we’ve been resilvering old antique mirrors, and making new ones. We are the exclusive source for the resilvering products we make which were sold by Minuteman, Inc. Would you like to ‘do-it-yourself?’ Do you have the time and place to dedicate to setting up shop and learning a new skill? If so, then you might want to buy our Mirror Resilvering Starter Kit, or ABC-X Resilvering Chemicals. Not sure? Take a look at our Resilvering ‘How-To’ DVD program.